These glossary entires were originally written for the Liberty Fund edition of the Collected Works of Frédéric Bastiat (2011). They should give some idea of the world of political economy in which Bastiat moved in the 1830s and 1840s. Anti-Corn Law League. The Anti-Corn Law League, "Corn League," or “League,” was founded in 1838 by Richard Cobden and John Bright in Manchester. Their initial aim was to repeal the law restricting the import of grain (“corn laws”), but they soon called for the unilateral ending of all agricultural and industrial restrictions on the free movement of goods between Britain and the rest of the world. For seven years they organized rallies, meetings, public lectures, and debates from one end of Britain to the other and managed to have proponents of free trade elected to Parliament. The Tory government resisted for many years but eventually yielded on 25 June 1846, when unilateral free trade became the law of Great Britain. Arrivabene, Giovanni, count (1787–1881). Italian aristocrat. He was forced to flee the Piedmont revolution of 1821 and was condemned to death in absentia for his role in the uprising. He settled in Belgium and wrote extensively on the conditions of the working class in such books as Sur la condition des laboureurs et des ouvriers belges (1845). He also translated works by James Mill and Nassau Senior into French. Baines, Edward (1774-1848). A leading radical journalist who owned the Leeds Mercury newspaper. He was active in numerous reform issues, such as antislavery, Catholic emancipation, the disestablishment of the church, and the removal of the corn laws. Although he was a close ally of Richard Cobden over the corn laws, he split with him over the question of compulsory education. Baines was a strict voluntaryist on the matter. Blaise, Adolphe Gustave (1811-86). A regular contributor to the Journal des économistes and other periodicals. With Joseph Garnier he edited a series of lectures given by Blanqui, Cours d’économie industrielle (1837-39), which he had given at the Consevatoire des arts et métiers. Blanqui, Jérôme Adolphe (1798-1854). Liberal economist; brother of the revolutionary socialist Auguste Blanqui. He became director of the prestigious École supérieure de commerce de Paris and succeeded Jean-Baptiste Say to the chair of political economy at the Conservatoire national des arts et métiers. He was elected deputy representing the Gironde from 1846 to 1848. Among his many works on political economy and sociology are the Encyclopédie du commerçant (1839-41), Précis élementaire d’économie politique (1842), and Les classes ouvrières en France (1848). Boyer-Fonfrède, Henri (1788-1841). Liberal publicist, economic journalist, and supporter of the July Monarchy. He founded the L’Indicateur and wrote Questions d’économie politique (1846). Bright, John (1811-89). Manufacturer from Lancashire and leading member of the Anti-Corn-Law League. Elected to the Commons in 1843, he pleaded for the equality of religions under the law, criticized the privileges of the Church of England, supported the separation of church and state, and asked for the right for Jews and atheists to swear a non-Christian oath and to be allowed to be elected to Parliament. Later, in 1869, he became minister of the Board of Trade in the Gladstone Cabinet. Brissot de Warville, Jacques Pierre (1754-93). Brissot was a member of the Girondin faction in the French Revolution and one of many Girondins who were executed during the Terror. [See Girondins]. He studied law and became a writer and journalist, becoming active in a number of liberal reformist groups, such as the abolitionist organization the Société des Amis des Noirs (which he founded). During the Revolution he was elected to the Legislative Assembly and then the National Convention. He opposed the execution of the king. Buchanan, David (1779-1848). Buchanan was a journalist, economist, and editor of Adam Smith’s Inquiry into the Nature and Causes of the Wealth of Nations, in Three Volumes. With notes, and an Additional Volume, by David Buchanan (1814). Buchanan,s notes on Smith were included in the French translation of Smith's Wealth of Nations published by Guillaumin in 1843. Carey, Henry C. (1793-1879). American economist who argued that national economic development should be promoted by extensive government subsidies and high tariff protection. The proofs of his book The Harmony of Interests, Agricultural, Manufacturing, and Commercial (1851) were sent to Bastiat in November 1850, before it appeared in print. After the publication of Bastiat’s Economic Harmonies (1851), Carey accused him of plagiarism and a bitter debate in the Journal des économistes ensued. Le Censeur and Le Censeur européen. A journal founded by Charles Comte and Charles Dunoyer. From 1815 to 1815 its full name was Le Censeur, ou examen des actes et des ouvrages qui tendent à détruire ou à consolider la constitution de l’État; later, from 1817 to 1819, it was called Le Censeur européen ou Examen de diverses questions de droit public et de divers ouverages littéraires et scientifiques, considérés dans leurs rapports avec les progrès de la civilization. The journal was devoted to political and economic matters and was a constant thorn in the side of first Napoleon’s empire and then the restored monarchy. It was threatened by closure by the authorities on several occasions and finally was forced to close in 1815. During this period of enforced leisure Comte and Dunoyer discovered the economic writings of Jean-Baptiste Say and when the journal reopened it tilted toward economic and social matters as a result. It was one of the most important journals of liberal thought in the early nineteenth century. Chevalier, Michel (1806-87). Liberal economist and alumnus of the École polytechnique. Minister of Napoleon III. Initially a Saint-Simonist, he was imprisoned for two years (1832-33). After a trip to the United States, he published Lettres sur l’Amérique du Nord (1836), Histoire et description des voies de communications aux Etats-Unis et des travaux d’art qui en dependent (1840-41), and Cours d’économie politique (1845–55).> He was appointed to the chair of political economy at the Collège de France in 1840 and became senator in 1860. He was an admirer of Bastiat and Cobden and played a decisive role in the treaty on free trade of 1860, between France and England (Chevalier was the signatory for France, while Cobden was the signatory for England). Clarkson, Thomas (1760-1846). With William Wilberforce was one of the leading figures in the campaign to abolish the slave trade (1807) and slavery itself (1833). Clément, Ambroise (1805-86). Economist and secretary to the mayor of Saint-Étienne for many years. Clément was able to travel to Paris frequently to participate in political economy circles. In the mid 1840s he began writing on economic matters and so impressed Guillaumin that the latter asked him to assume the task of directing the publication of the important and influential Dictionniare de l’économie politique, in 1850. Clément was a member of the Société d’économie politique from 1848, a regular writer and reviewer for the Journal des économistes, and was made a corresponding member of the Académie des sciences morales et politiques in 1872. He wrote the following works: Recherches sur les causes de l'indigence (1846); Des nouvelles Idées de réforme industrielle et en particulier du projet d'organisation du travail de M. Louis Blanc (1846); La crise économique et sociale en France et en Europe (1886); as well as an early review of Bastiat’s Economic Harmonies for the Journal des économistes (1850), in which he praised Bastiat’s style but criticized his position on population and the theory of value. Cobden, Richard (1804-65). Founder of the Anti-Corn Law League. Born of a poor farmer’s family, he was trained by an uncle to become a clerk in his warehouse. At twenty-one, he became a travelling salesman, and was so successful that he was able to set up his own business by acquiring a factory making printed cloth. Thanks to his vision of the market and his sense of organization, his company became very prosperous. Nevertheless, at the age of thirty, he left the management of the company to his brother in order to travel. He wrote some remarkable articles in which he defended two great causes: pacifism, in the form of non intervention in foreign affairs, and free exchange. From 1839, he devoted himself exclusively to the Anti-Corn Law League and was elected as MP for Stockport in 1841. Toward the end of the 1850s, he was asked by the government to negotiate a freedom of exchange treaty with France. His French counterpart was Michel Chevalier, a minister of Napoleon III and a friend and admirer of Bastiat. The treaty was signed by Cobden and Chevalier in 1860. Cobden and the League (OC, vol. 3: Cobden et la ligue: ou, L'agitation anglaise pour la liberté du commerce). First published in 1845 by Guillaumin as a separate book before it was reissued in his Oeuvres complètes. Bastiat was so impressed with the organization and tactics of the Anti-Corn-Law League in Britain that he wished to emulate it in France. He was ultimately largely unsuccessful. As part of his efforts to inspire the French people to pressure the government for tariff reform he put together this collection of translations of many of the League’s pubic speeches, newspaper reports of their meetings, and other documents of the campaign. He prefaced the book with a long introduction in which he outlined the League’s goals and beliefs (see OC, vol. 3, p. 1, “Introduction.”). Comte, Charles (1782-1837). Lawyer, liberal critic of Napoleon and then the restored monarchy, and son-in-law of Jean-Baptiste Say. One of the leading liberal theorists before the 1848 revolution, he founded, with Charles Dunoyer, the journal Le Censeur in 1814 and Le Censeur européen in 1817 and was prosecuted many times for challenging the press censorship laws and criticizing the government. He came across the ideas of Say in 1817 and discussed them at length in Le Censeur européen. After having spent some time in prison he escaped to Switzerland, where he was offered the Chair of Natural Law at the University of Lausanne before he was obliged to move to England. In 1826 he published the first part of his magnum opus, the four-volume Traité de législation, which very much influenced the thought of Bastiat, and the second part, Traité de la propriété in 1834. Comte was secretary of the Académie des sciences morales et politiques and was elected a deputy representing La Sarthe after the 1830 revolution. Condillac, Étienne Bonnot, abbé de (1714-80). Condillac was a priest, philosopher, economist, and member of the Académie française; He was an advocate of the ideas of John Locke and a friend of the encyclopedist Denis Diderot. In his Traité des sensations (>Treatise on Sensations) (1754), Condillac claims that all attributes of the mind, such as judgment, reason, and even will, derive from sensations. His work Le Commerce et le gouvernement, considérés relativement l'un a l'autre >(Commerce and Government Considered in Their Mutual Relationship) (1776) appeared in the same year as Adam Smith’s Wealth of Nations. Constant, Benjamin (1767-1830). Novelist, politician, and political theorist. Born in Lausanne, Constant was a close friend of Germaine de Staël and accompanied her to Paris in 1795. He was a supporter of the Directory and a member of the Tribunat but came to oppose the loss of political liberty under Napoleon. He became a staunch opponent of Napoleon, but in spite of this he was approached by him during the “Hundred Days” (period between Napoleon’s return from exile on Elba to Paris on 20 March 1815 and the restoration of King Louis XVIII on 8 July 1815) to draw up a constitution for a more liberal, constitutional empire. Constant became a deputy in 1819 and continued to defend constitutional freedoms until his death. He is best known for his novel Adolphe (1807), Principes de politique applicables à tous les gouvernements (1815) (published in English by Liberty Fund), De l’esprit de conquête et de l’usurpation, dans leurs rapports à la civilization européen (1814), and Cours de politique constitutionelle (1820). Corn Laws. The “corn laws” were legislation introduced by Parliament in the seventeenth century to maintain a high price for “corn” (in the British context this meant grain, especially wheat) by preventing the importation of cheaper foreign grain altogether or by imposing a duty on it in order to protect domestic producers from competition. The laws were revised in 1815 following the collapse of wheat prices at the end of the Napoleonic Wars. The artificially high prices which resulted led to rioting in London and Manchester. The laws were again amended in 1828 and 1842 to introduce a more flexible sliding scale of duties which would be imposed when the domestic price of wheat fell below a set amount. The high price caused by protection led to the formation of opposition groups, such as the Anti-Corn Law League in 1838, and to the founding of the magazine The Economist in 1843. Pressure for repeal came from within Parliament by members of Parliament, such as Richard Cobden (elected 1841), and from without by a number of factors: the well-organized public campaigning by the Anti-Corn-Law League; the writings of classical economists who were nearly universally in favor of free trade; the writings of popular authors such as Harriet Martineau, Jane Marcet, and Thomas Hodgskin; and the pressure of crop failures in Ireland in 1845. The Conservative prime minister Sir Robert Peel announced the repeal of the corn laws on 27 January 1846, to take effect on 1 February 1849 after a period of gradual reduction in the level of the duty. The Act was passed by the House of Commons on 15 May and approved by The House of Lords on 25 June, thus bringing to an end centuries of agricultural protection in England. Daire, Eugene (1798-1847). Daire was of all things a tax collector who revived interest in the heritage of eighteenth- and early nineteenth-century free-market economics. He came to Paris in 1839, met Guillaumin, discovered the works of Jean-Baptiste Say, and began editing the fifteen-volume work, Collection des principaux economists (1840-48). It included works on eighteenth-century finance, the physiocrats, Turgot, Adam Smith, Malthus, Jean-Baptiste Say, and Ricardo. Destutt de Tracy, Antoine (1754-1836). Tracy was one of the leading intellectuals of the 1790s and early 1800s and a member of the ideologues (a philosophical movement not unlike the objectivists, who professed that the origin of ideas was material–not spiritual). In his writings on Montesquieu, Tracy defended the institutions of the American Republic, and in his writings on political economy he defended laissez-faire. During the French Revolution he joined the third estate and renounced his aristocratic title. During the Terror he was arrested and nearly executed. Tracy continued agitating for liberal reforms as a senator during Napoleon’s regime. One of his most influential works was the four-volume Éléments d’idéologie (first published in 1801-15) (Tracy coined the term “ideology”). He also wrote Commentaire sur l'ésprit des lois (1819), which Thomas Jefferson translated and brought to the United States. In 1822 he published his Traité d’économie politique (1823), much admired by Jefferson and Bastiat. Doctrinaires. The Doctrinaires were the group of liberal constitutional monarchists who emerged during the restoration of the French monarchy, between 1815 and 1830. They included such people as Pierre Paul Royer-Collard, François Guizot, Élie Decazes, and Maine de Biran, and the journals in which they wrote included the Le Constitutionnel and the Le Journal des débats. The aim of the Doctrinaires was to steer a middle course between an outright return to the pre-1789 status quo (supported by the Legitimists) and a republic based on full adult suffrage (supported by the socialists and the radical liberals). The Doctrinaires supported King Louis XVIII, the constitution of 1814, and a severely restricted electorate of wealthy property owners and tax payers who numbered barely 100,000 people. Their main principles were articulated by François Guizot in Du gouvernement représentatif et de l'état actuel de la France (1816). Droz, Joseph (1773-1850). Moral philosopher, economist, literary critic, and father-in-law of Michel Chevalier. Some of his notable publications include Lois relatives au progrès de l’industrie (1801); Économie politique, ou, Principes de la science des richesses (1829); and Applications de la morale a la politique (1825). He was appointed to the Académie française in 1813 and to the Académie des sciences morales et politiques in 1833. Dunoyer, Barthélémy-Pierre-Joseph-Charles (1786-1862). Dunoyer was a journalist; academic (a professor of political economy); politician; author of numerous works on politics, political economy, and history; a founding member of the Société d’ économie politique (1842); and a key figure in the French classical liberal movement of the first half of the nineteenth century, along with Jean-Baptiste Say, Benjamin Constant, Charles Comte, Augustin Thierry, and Alexis de Tocqueville. He collaborated with Comte on the journal Le Censeur and Le Censeur européen during the end of the Napoleonic empire and the restoration of the Bourbon monarchy. Dunoyer (and Comte), combined the political liberalism of Constant (constitutional limits on the power of the state, representative government), the economic liberalism of Say (laissez-faire, free trade), and the sociological approach to history of Thierry, Constant, and Say (class analysis, and a theory of historical evolution of society through stages culminating in the laissez-faire market society of “industry.” His major works include L'Industrie et la morale considérées dans leurs rapports avec la liberté (1825), Nouveau traité d'économie sociale (1830), and his three-volume magnum opus, De la liberté du travail (1845). After the revolution of 1830 Dunoyer was appointed a member of the Académie des sciences morales et politiques, worked as a government official (he was prefect of L’Allier and La Somme), and eventually became a member of the Council of State in 1837. He resigned his government posts in protest against the coup d’état of Louis Napoléon in 1851. He died while writing a critique of the authoritarian Second Empire, which was completed and published by his son Anatole in 1864. Dupin, Charles (1784-1873). Deputy. He was an alumnus of the École polytechnique, a naval engineer, and a professor of mechanics at the Conservatoire national des arts et métiers, where he taught courses for working people. He is one of the founders of mathematical economics and the statistical office (Bureau de France). Dussard, Hyppolite (1791-1879). Journalist, essayist, and economist, he was manager of Le Journal des économistes from 1843 to 1845, a collaborator of the Revue encyclopédique, and prefect of la Seine-Inférieure after the 1848 revolution. The Economists (les Économistes). The liberal, free-trade political economists referred to themselves, perhaps somewhat arrogantly, as "the" economists. Bastiat and his colleagues believed that, because their doctrine was founded on natural law and a scientific study of the way markets and economies worked in reality, there could be only one school of economics (just as there could be only one school of mechanics or optics). On the other hand, the opponents of free markets (such >as the followers of Fourier, Robert Owen, Etienne Cabet, Louis Blanc, Peirre Proudhon, and Pierre Leroux) had as many schools of socialist thought as they could imagine different ways in which society might be restructured or reorganized according to their utopian visions.> the followers of Fourier and Owen, MM. Cabet, Louis Blanc, Proudhon, Pierre Leroux. How more than grateful are his slumbers brief. Thou dost not know, thou pamper'd son of sloth! Thou canst not tell, thou bread-tax-eating thief! How sweet is rest to bread-tax'd toil and grief! Evans, William [dates unknown]. Chairman of the Emancipation Society and one of the pall bearers at Richard Cobden’s funeral. Faucher, Léon (1803-54). Faucher was a journalist, writer, and deputy for the Marne who was twice appointed minister of the interior. He became an active journalist during the July Monarchy writing for Le Constituionnel, and Le Courrier français and was one of the editors of the Revue des deux mondes and the Journal des économistes. Faucher was appointed to the Académie des sciences morales et politiques in 1849 and was active in L’Association pour la liberté des échanges. He wrote on prison reform, gold and silver currency, socialism, and taxation. One of his better-known works was Études sur l’Angleterre (1856). Fix, Theodore (1800-46). Fix was born in Switzerland and came to France to work as a land surveyor. He soon moved to Paris to work as a translator of German texts. After becoming interested in economics, he and Sismondi began in 1833 a short-lived journal, the Revue mensuelle d'économie politique, which lasted only three years. One of the notable aspects of Fix’s works was his fluency in both German and English, which allowed him to write with authority for a French-speaking audience on the economics works published in those languages. In the course of his work Fix met many well-respected French political economists, such as Rossi and Blanqui; wrote several articles for the Journal des économistes; and became the chief economics writer for the periodical Le Constitutionnel. Before he died, very young from heart disease, he published one book, Observations sur l’état des classes ouvrières (1846). Fontenay, Roger-Anne-Paul-Gabriel de (1809-1891). Little is known about Fontenay's early life. He comes to prominence as a member of the Société d'Économie Politique in 1850 and as an ally of Bastiat in their debates in the Society on the nature of rent. 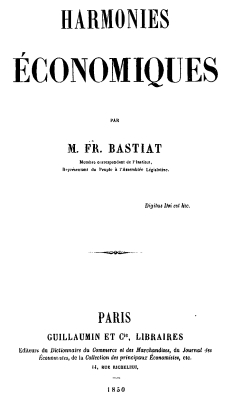 In a work published soon after Bastiat's death in 1850, Du Revenu foncière (Paris: Guillaumin, 1854), Fontenay decribes himself and Bastiat as forming a distinct "French School of Political Economy" tracing its roots back to Jean-Baptiste Say and including Destutt deTracy, Charles Comte, and especially Charles Dunoyer; in contrast to the "English School" of Adam Smith, Thomas Malthus, and David Ricardo. The sticking point was the issue of rent from land, with Bastiat and Fontenay denying that there was any special "gift of nature" which made up the rents from land, instead arguing that all returns on investments (whether capital, intererst, or rent) were the result of services provided by producers to consumers. Fontenay worked with Prosper Paillottet in editing the works of Bastiat which appeared in 1854-55 in 6 volumes. He was a regular contributor to the Journal des Économistes right up to his death, penning many book reviews as well as articles on topics such as Malthus and Marx. He also served on the editorial board of the Journal des Économistes. Another work by Fontenay was Les Congrégations et la loi à faire (Paris: C. Marpon et E. Flammarion, 1882). Fonteyraud, Henri Alcide (1822-49). Fonteyraud was born in Mauritius and became professor of history, geography, and political economy at the École supérieure de commerce de Paris. He was a member of the Société d’économie politique and one of the founders of the Association pour la liberté des échanges. Because of his knowledge of English he went to England in 1845 to study at first hand the progress of the Anti-Corn-Law League. During the 1848 revolution he campaigned against socialist ideas with his activity in Le Club de la liberté du travail and, along with Bastiat, Coquelin, and Molinari, by writing and handing out in the streets of Paris copies of the broadside pamphlet Jacques Bonhomme. Sadly, he died very young during the cholera epidemic of 1849. He wrote articles in La Revue britannique and Le Journal des économistes, and he edited and annotated the works of Ricardo in the multivolume Collection des principaux économistes. His collected works were published posthumously as Mélanges d’économie politique, edited by J. Garnier (1853). Fould, Achille (1800-1867). Fould was a banker and a deputy who represented the départements of Les Hautes-Pyrénées in 1842 and La Sein in 1849. He was close to Louis-Napoléon, lending him money before he became emperor, and then serving as minister of finance, first during the Second Republic and then under the Second Empire (1849-67). Fould was an important part of the imperial household, serving as an adviser to the emperor, especially on economic matters. He was as ardent free trader but was close to the Saint-Simonians on matters of banking. (For the Saint-Simonians, see the entry for Claude Henri de Rouvroy Saint-Simon.). Free Trade Association (Association pour la liberté des échanges). Founded in February 1846 in Bordeaux. Bastiat was the secretary of the Board, presided over by François d'Harcourt, and having among its members Michel Chevalier, Auguste Blanqui, Joseph Garnier, Gustave de Molinari, and Horace Say. Garnier, Joseph (1813-81). Garnier was a professor, journalist, politician, and activist for free trade and peace. He came to Paris in 1830 and came under the influence of Adolphe Blanqui, who introduced him to economics and eventually became his father-in-law. Garnier was a pupil, professor, and then director of the École supérieure de commerce de Paris, before being appointed the first professor of political economy at the École des ponts et chaussées in 1846. Garnier played a central role in the burgeoning free-market school of thought in the 1840s in Paris. He was one of the founders of L’Association pour la liberté des échanges (Free Trade Association) and the chief editor of its journal, Libre échange; he was active in the Congrès de la paix; he was one of the founders along with Guillaumin of the Journal des économistes, of which he became chief editor in 1846; he was one of the founders of the Société d’économie politique and was its perpetual secretary; and he was one of the founders of the 1848 liberal broadsheet Jacques Bonhomme. Garnier was acknowledged for his considerable achievements by being nominated to join the Académie des sciences morales et politiques in 1873 and to become a senator in 1876. He was author of numerous books and articles, among which include Introduction à l’étude de l’Économie politique (1843); Richard Cobden, les ligueurs et la ligue (1846); and Congrès des amis de la paix universelle réunis à Paris en 1849 (1850). He edited Malthus’s Essai sur le principe de population (1845); Du principe de population (1857); and Traité d'économie politique sociale ou industrielle (1863). General Council on Agriculture, Industry, and Trade. Created by a decree of 1 February 1850, the Council resulted from the merger of three councils (respectively agriculture, industry, and commerce) that were separate up to then. It had 236 members, 96 for agriculture, 59 for industry, 73 for commerce, and 8 for Algeria and the colonies. Its role was to enlighten the government on economic matters. The first session took place from 7 April to 11 May 1850 in the Luxembourg Palace and was opened by the president of the Republic. Genovesi, Antonio (1712-1769). Italian priest, philosopher, and economist (liberal). Girondins. The Girondins were a group of liberal-minded and moderate republican deputies and their supporters within the Legislative Assembly (1791-92) and National Convention (1792-95), in the early phase of the French Revolution. They got their name from the fact that many of the deputies came from the Gironde region in southwest France, near the major port city of Bordeaux. An important meeting place for the Girondins, where they discussed their ideas and strategies, was the salon of Madam Roland (1754-93). Other members of the group included Jean Pierre Brissot, Pierre Victurnien Vegiaud, Charles Barabroux, Thomas Paine, and the marquis de Condorcet. In their bitter rivalry with other groups within the Jacobin group (in particular Robespierre and the Mountain faction), they disputed the proper treatment and punishment of the deposed king, the war against Austria, and the other monarchical powers that threatened France with invasion, and how far the radical policies of the revolution needed to be pushed. Eventually they lost out to the radical Jacobins around Robespierre and many of them were imprisoned and executed during the Terror. Guillaumin, Gilbert-Urbain (1801-64). Guillaumin was orphaned at the age of five and was brought up by his uncle. He came to Paris in 1819 and worked in a bookstore before eventually founding his own publishing firm in 1835. He became active in liberal politics during the 1830 revolution and made contact with the economists Adlophe Blanqui and Joseph Garnier. He became a publisher in 1835 in order to popularize and promote classical liberal economic ideas, and the firm of Guillaumin eventually became the major publishing house for liberal ideas in the mid nineteenth century. Guillaumin helped found the Journal des économistes in 1841 with Horace Say (Jean-Baptiste’s son) and Joseph Garnier. The following year he helped found the Société d’économie politique. His firm published scores of books on economic issues, making its catalog a virtual who’s who of the liberal movement in France and included works by Bastiat. Guillaumin also published the following key journals, collections, and encyclopedias: Journal des économistes (1842–1940), L’Annuaire de l'économie politique (1844–99), the multivolume Collection des principaux économistes (1840–48),Bibliothèques des sciences morales et politiques (1857–), Dictionnaire d’économie politique (1852) (coedited with Charles Coquelin), and Dictionnaire universel théorique et practique du commerce et de la navigation (1859-61). Harcourt, François-Eugène, duc d’ (1786-1865). Liberal politician, president of L’association pour la liberté des échanges in Brussells, in 1841, and ambassador to Rome. He wrote Discours en faveur de la liberté du commerce (1846). Joseph Hume (1777-1855). Member of Parliament elected in 1812. Leader of the liberal reformists, he played a major role in the repeal of laws forbidding machinery export and emigration and in the emancipation of Catholics. Huskisson, William (1770-1830). Huskisson was a British Member of Parliament who served from 1796 to 1830. He rose to the post of secretary to the treasury 1804-09 and later president of the Board of Trade (1823-27). Huskisson introduced a number of liberal reforms, including the reformation of the Navigation Act, a reduction in duties on manufactured goods, and the repeal some quarantineduties. As president of the Board of Trade he played an important role in persuading British merchants to support a policy of free trade. Industry (“L’industrie,” “l’industrielisme,” “les industriels”). Bastiat got many of his ideas from reading a number of classical liberal theorists who were active during Napoleon’s Empire and the Restoration, most notably the economist Jean-Baptiste Say (1767-1832), and the lawyers and journalists Charles Comte (1782-1837) and Charles Dunoyer (1786-1862). The latter developed an “industrialist theory” of history in which the class of “industriels” played an important role. According to this school of thought there were only two means of acquiring wealth, by productive activity and voluntary exchanges in the free market (“industrie”—which included agriculture, trade, factory production, services, etc.) or by coercive means (conquest, theft, taxation, subsidies, protection, transfer payments, slavery). Anybody who acquired wealth through voluntary exchange and productive activities belonged to a class of people collectively called “les industrieux”; in contrast to those individuals or groups who acquired their wealth by force, coercion, conquest, slavery, government privileges. The latter group were seen as a ruling class or as “parasites” who lived at the expense of “les industrieux.” See Dunoyer’s L'Industrie et la morale considérées dans leurs rapports avec la liberté (1825). See also the entries in for J. B. Say, Comte, and Dunoyer in the glossary of names. A parallel group of thinkers who shared many of these views developed around Henri Saint-Simon, who advocated rule by a technocratic elite rather than the operations of the free market as did Say, Comte, Dunoyer, and Bastiat. Jacques Bonhomme.A short-lived biweekly paper that seems to have lasted for only four issues (June–July 1848). It was founded and largely written by Bastiat, Alcide Fonteyraud, Charles Coquelin, Joseph Garnier, and Gustave de Molinari in 1848. Its purpose was to counter socialist ideas during the 1848 revolution, and it was handed out in the streets of Paris. In a review of a collection of letters Bastiat wrote to the Cheuvreux family, which were not included in Paillotet’s Oeuvres Complètes, Gustave de Molinari reminisced about his revolutionary activities with Bastiat in 1848. Bastiat was then forty-seven and Molinari twenty-nine. Molinari notes that the February revolution forced the young radical liberals to "replace our economic agitation with a politico-socialist agitation," which they did on 24 February, when Molinari and a young friend decided to start a new magazine to be called La République. The prime minister at the time, François Guizot, was forced to resign on 23 Febraury, and a provisional government was formed on 26 February (thus, Molinari and his friend tried to start their new journal the day after the revolution broke out). Molinari asked Bastiat if would join him as coeditor; Bastiat agreed to do so with the understanding that they abide by the censorship laws, which at the time called for approval by the government before publication took place. Molinari wryly noted that Bastiat told them that "we may be making a revolution but revolutions do not violate the laws!" So the three of them proceeded to the Hôtel-de-Ville in order to have their hastily written screed approved by the government, but the building was in complete turmoil with armed revolutionaries milling about. They wisely decided that the provisional government was “otherwise occupied" and Bastiat consented to publish the journal without prior approval. In Montmartre, on their way to the printer, they came across another would-be revolutionary hawking in the street a journal that had already taken the name La République, such was the competition at the time for catchy titles. The three decided on the spot to rename their journal La République française and had 5,000 copies printed and distributed. Like most periodicals at the time the République française lasted a very short while but it did include a number of "striking" articles penned by Bastiat directed at the working class who were pushing the revolution in an increasingly socialist direction. As Molinari notes, their journal "was decidely not at the peak of the events" which were swirling about them and it soon folded. Undaunted, Molinari and Bastiat decided to launch another journal, this time directed squarely at working people, to be called Jacques Bonhomme, which comes from the nickname given to the average working Frenchman. They joined with Charles Coquelin, Alcide Fonteyraud, and Joseph Garnier to launch the new journal in June 1848, just before the June Days uprising (23-26 June) took place. On June 21 the government decided to close the so-called National Workshops, which were a government program to provide state subsidised employment to unemployed workers, because of out of control expences. This was promptly followed by a mass uprising in Paris to protest the decision and troops were called in to suppress the protesters causing considerable loss of life. While this was happening Bastiat sent Molinari and the editorial committee an article he had writen entitled "Dissolve the Natonal Workshops!" which appeared on the front page of the very last issue of Jacques Bonhomme. This is the political context in which Bastiat wrote the first draft of his best-known pamphlet, The State, which appeared three months later in the 25 September issue of Le Journal des débats. Le Journal des débats. A journal founded in 1789 by the Bertin family and managed for almost forty years by Louis-François Bertin. The journal went through several title changes and after 1814 became the Journal des débats politiques et littéraires. The journal likewise underwent several changes of political positions: it was against Napoleon during the First Empire; under the second restoration it became conservative rather than reactionary; and under Charles X it was in support of the liberal stance espoused by the doctrinaires. It ceased publication in 1944. Le Journal des économistes. The Journal des économistes: revue mensuelle de l'économie politique, des questions agricoles, manufacturières et commerciales was the journal of the Société d’économie politique and appeared from December 1841 until the fall of France, in 1940. It was published by the firm of Guillaumin, which also published the writings of most of the liberals of the period. The Journal des économistes was the leading journal of the free-market economists (known as “les économistes”) in France in the second half of the nineteenth century. It was edited by Adolphe Blanqui (1841-42), Hippolyte Dussard (1843-45), Joseph Garnier (1845-55), Henri Baudrillart (1855-65), Joseph Garnier (1865-81), Gustave de Molinari (1881-1909), and Yves Guyot (1910-). 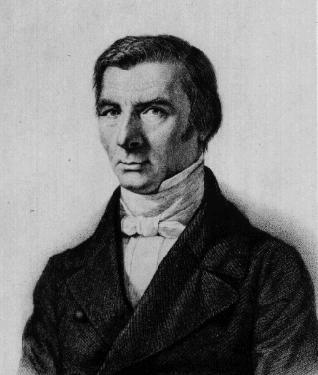 Bastiat published many articles in the journal, many of which were later published as pamphlets and books, and his works were all reviewed there. There are fifty-eight entries under Bastiat’s name in the table of contents of the journal for the period 1841 to 1865. Lafarelle, Félix de (1800-1872). Lawyer and economist. He was deputy of La Garde de 1842 in the revolution of 1848 and correspondent of the Académie des sciences morales et politiques, 1846. He was author of Du progrès social au profit des classes populaires nonindigentes (1847). Laffite, Jacques (1767-1844). Banker and entrepreneur, born in Bayonne. He was elected deputy in 1816 and was prime minister from 1831 until March 1832. Friend of the Bastiat family. Laissez-faire. In English the phrase “laissez-faire” has come to mean the economic system in which there is no regulation of economic activity by the state. Other terms have also been used to mean the same thing, such as the “Manchester School” or “Cobdenism,” thus linking this policy prescription to the ideas of Richard Cobden and the Anti-Corn Law League. The origins of the term “laissez-faire” are not clear. One account attributes the origin to the merchant and Physiocrat Vincent de Gournay (1712-59), who used a slightly longer version of the phrase, “laissez faire, laissez passer” (let us do as we wish, let us pass unrestricted), to describe his preferrred government economic policy. Another Physiocrat, Anne-Robert-Jacques Turgot (1727-81), attributes the phrase “laissez-nous faire” (let us do as we wish), to the seventeenth-century merchant Legendre, who used the phrase in an argument with the French minister of finance Colbert about the proper role of government in the economy. Yet a third Physiocrat, François Quesnay (1694-1774), combined the term with another phrase: “Laissez-nous faire. Ne pas trop gouverner” (Let us do as we wish. Do not govern us too much) to make the same point. A contemporary of Bastiat, Joseph Garnier (1813-81), in the entry for “laissez faire, laissez passer” in the Dictionnaire de l’économie politique (1853) explained “laissez-faire” to mean “laissez travailler” (leave us free to work as we wish) and “laissez passer” to mean “laissez échanger” (leave us free to trade as we wish). Le Libre échange. The weekly journal of the Association pour la liberté des échanges. It began in 1846 as Le Libre-échange: journal du travail agricole, industriel et commercial but changed its name to the simpler Libre échange at the start of its second year of publication. It closed in 1848 as a result of the revolution. The first fifty-two issues were published as a book by the Guillaumin publishing firm under the title Le Libre-échange, journal de l’asociation pour la liberté des échanges (1847). The first sixty-four issues were published by Bastiat, the editor in chief, and Joseph Garnier; the last eight issues were published by Charles Coquelin. The journal’s editorial board included Anisson-Dupéron (pair de France), Bastiat, Blanqui, Gustave Brunet (assistant to the mayor of Bordeaux), Campan (secretary of the Chamber of Commerce of Bordeaux), Michel Chevalier, Coquelin, Dunoyer, Faucher, Fonteyraud, Garnier, Louis Leclerc, Molinari, Paillotet, Horace Say, and Wolowski. McCulloch, John Ramsay (1789-1864). McCulloch was the leader of the Ricardian school following the death of Ricardo. He was a pioneer in the collection of economic statistics and was the first professor of political economy at the University of London in 1828. He wrote The Principles of Political Economy: With a Sketch of the Rise and Progress of the Science (Edinburgh, W. and C. Tait, 1825). Malthus, Thomas Robert (1766-1858). Malthus is best known for his writings on population, in which he asserted that population growth (increasing at a geometric rate) would outstrip the growth in food production (growing at a slower arithmetic rate). Malthus studied at Jesus College, Cambridge, before becoming a professor of political economy at the East India Company College (Haileybury). His ideas were very influential among nineteenth-century political economists. His principal works were An Essay on the Principle of Population (1st ed., 1798; rev. 3rd ed., 1826). Mignet, François-Auguste-Alexis (1796-1884). Mignet was a liberal lawyer, journalist, and historian who was an editor of the Courrier français and the National (edited by Mignet, Thiers, Carrel, and Passy). In 1830 he joined other journalists in protesting the restrictive press laws. He secured a job as the director of the Archives of the Foreign Ministry, from which post he was able to publish many historical works. He lost his job as a result of the 1848 revolution and took early retirement to continue writing works of history. He became a member of the Académie des sciences morales et politiques in 1832, becoming its permanent secretary in 1837, and a member of the Académie française in 1836. His main works were Histoire de la Révolution française (1824), Histoire de Marie Stuart (1852), and Notices et Mémoires historiques (1843), which contains many eulogies of important political economists and historians. Mill, John Stuart (1806-73). Mill was an English philosopher, political theorist, and economist who became of the most influential thinkers of the nineteenth century. He worked for the East India Company before becoming a member of the British Parliament (1865-68), where he introduced many pieces of reform legislation, such as women’s suffrage. Mill went to France in 1820 and met many of the leading liberal figures of the day, such as Jean-Baptiste Say. He had a great interest in French politics and history and wrote many essays and reviews on these topics. His best-known books include System of Deductive and Inductive Logic (1843), Principles of Political Economy (1848), On Liberty (1859), Utilitarianism (1861), and The Subjection of Women (1869). Mirabeau, Gabriel Honoré Riqueti, comte de (1749-91). Honoré was the eldest son of the economist Victor Riqueti. He was a soldier as well as a diplomat, journalist, and author who spent time in prison or in exile. During the French Revolution he became a noted orator and was elected to the estates-general in 1789 representing Aix and Marseilles. In his political views he was an advocate of constitutional monarchy along the lines of Great Britain. He is noted for his Essai sur le despotisme (1776) and several works on banking and foreign exchange. Mimerel de Roubaix, Pierre (1786-1872). Mimerel was a textile manufacturer and politician who was a vigorous advocate of protectionism. He was elected deputy in 1849; appointed by Napoleon III to the Advisory Council and to the General Council of Manufacturing, Agriculture and Commerce; and named Senator in 1852. He founded the protariff Committee for the Defense of Domestic Industry, whose journal was Le Moniteur industriel. He also headed a businessmen’s association called the “Mimerel Committee,” which was a focus for Bastiat’s criticims of protectionism. It was the Mimerel Committee that called for the firing of free-market professors of political economy and for their chairs to be abolished. The committee later moderated its demands and called for the equal teaching of protectionist and free-trade views. Molinari, Gustave de (1819-1912). Molinari was born in Belgium but spent most of his working life in Paris, becoming the leading representative of the laissez-faire school of classical liberalism in France in the second half of the nineteenth century. His liberalism was based upon the theory of natural rights (especially the right to property and individual liberty), and he advocated complete laissez-faire in economic policy and the ultraminimal state in politics. During the 1840s he joined the Société d’économie politique and was active in the Association pour la liberté des échanges. During the 1848 revolution he vigorously opposed the rise of socialism and published shortly thereafter two rigorous defenses of individual liberty in which he pushed to its ultimate limits his opposition to all state intervention in the economy, including the state's monopoly of security. During the 1850s he contributed a number of significant articles on free trade, peace, colonization, and slavery to the Dictionnaire de l'économie politique (1852-53) before going into exile in his native Belgium to escape the authoritarian regime of Napoleon III. He became a professor of political economy at the Musée royale de l'industrie belge and published a significant treatise on political economy (Cours d'économie politique, 1855) and a number of articles opposing state education. In the 1860s Molinari returned to Paris to work on the Journal des debats, becoming editor from 1871 to 1876. Toward the end of his long life Molinari was appointed editor of the leading journal of political economy in France, the Journal des économistes (1881-1909). Some of Molinari’s more important works include Les Soirées de la rue Saint-Lazare (1849), L'Évolution économique du dix-neuvième siècle: Théorie du progrès (1880), and L'Évolution politique et la révolution (1884). Monjean, Maurice (1818-?). A member of the editorial board of the Journal des économistes from 1841 to 1845. He also edited Malthus’s Principles of Population and Definitions of Political Economy in the series Collection des principaux economists (1846). Montalembert, Charles Forbes, comte de (1810-70). Montalembert was born and educated in England before moving to France. In 1830 he joined forces with Lamennais to write for the journal L’Avenir and to promote liberal Catholicism, but he split with Lamennais after 1834, when the pope condemned liberal catholicism, Montalembert choosing to submit to the will of the pope on this issue. He supported a free, Catholic alternative to the state monopoly of eduction and was arrested and fined for his activities. During the 1848 revolution he was elected to the Constituent Assembly as a moderate republican. He is known for his work Des devoirs des Catholiques sur la question de la liberté de l’enseignement (1843). Montesquieu, Charles Louis de Secondat, baron de (1689-1755). Montesquieu was one of the most influential legal theorists and political philosophers of the eighteenth century. He trained as a lawyer and practiced in Bordeaux before going to Paris, where he attended an important enlightened salon. His ideas about the separation of powers and checks on the power of the executive had a profound impact on the architects of the American constitution. His most influential works are L’Ésprit des lois (The Spirit of the Laws) (1748), Les Lettres persanes (Persian Letters) (1721), and Considérations sur les causes de la grandeur des Romains et leur décadence (Considerations of the Causes of the Greatness of the Romans and their Decline) (1732). Morin, Étienne-François-Théodore (1814-?). Morin was a textile manufacturer and the elected representative for the département of La Drôme in the Constituent Assembly in 1848 and then in the Legislative Assembly in 1849. He published many works on jurisprudence and political economy, being best known for his Essai sur l'organisation du travail et l'avenir des classes laborieuses (1845). Morin was a staunch defender of freedom of association for both manufacturers as well as for the workers in order to promote their interests, provided that no one used any coercion or violence. Navigation Act. The act prevented merchandise from being imported into Britain if it was not transported by British ships or ships from the producer countries. The first act, adopted in 1651, applied to commerce within Europe and generated a war with Holland (1652-54). Extended to colonies in 1660 and 1663, it generated a second war with Holland (1665-67). It was repealed in 1849. Necker, Jacques (1732-1804). Necker was a Swiss-born banker and politician who served as the minister of finiance under Louis XVI just before the French Revolution broke out. His private financial activities were intertwined with the French state when he served as a director of the monopolistic French East India Company and made loans to the French state. In 1775 he wrote a critique of Turgot’s free-trade policies in L’Essai sur la législation et le commerce des grain. In 1776 he was appointed director general of French finances unitl his dismissal in 1781. He served again in this position from 1788 to 1790. As minister of finance he tried to reform the French taxation system by broadening its base and removing some of its worst inequalities. Needless to say, in this he largley failed. His daughter, Germaine Necker (de Staël), became a famous novelist and historian of the French Revolution. Odier, Antoine (1766-1853). Odier was Swiss by birth but came to Paris to play a part in the French Revolution, siding with the liberal Girondin group. He was a banker and textile manufacturer, president of the Chamber of Commerce of Paris, a deputy (1827-34), and eventually a peer of France (1837). Bastiat crossed swords with him because of his membership in the protectionist Association for the Defense of National Work, also known as the Assocaition for the Defense of Domestic Industry. Paillottet, Prosper (1804-78). Paillotet is best known for his friendship with Bastiat, joining Bastait's Free Trade Association in its earliest days and then caring for Bastiat when he was very ill in Italy, being with him during his last few days. Paillottet was vice-president of the Labor Tribunal (Conseil des Prud'hommes) and a member of the Commission for the Encouragement of Workers' Associaitons and of the Society of Political Economy. Paillottet was a successful businessman, making his money in the jewellry business and then devoting most of his energies to philanthropic causes. He became active in the Free Trade Association, even learning English in order to help Bastiat translate material on or by the Anti-Corn Law League. As Bastiat's health worsened Paillottet became his virtual secretary, editor, and research assistant. Paillottet wrote several articles and book reviews that appeared in Le Journal des économistes, two articles of which were published seaprately in book form. See the biblography for a listing of works by Paillottet. Paillottet was best known for editing the collected works of Bastiat, Les Oeuvres complètes de Frédéric Bastiat, which is the basis for this collection. Some of the material for this entry was drawn from Passy, "Nécrologie. Prosper Paillottet." Passy, Frédéric (1822-1912). Nephew of Hippolyte Passy. He was a supporter of free trade and the ideas of Richard Cobden and Bastiat. Passy was a cabinet minister and then professor of political economy at Montpellier. He wrote an introduction to one of the Guillaumin editions of the works of Bastiat. He was active in the French peace movement and helped found the Ligue internationale et permanente de la paix. For his efforts he received the first Nobel Peace Prize (1901, with Henri Dunant, one of the founders of the Red Cross). He wrote many books on economics and peace, including Notice biographique sur Frédéric Bastiat (1857) and Pour la paix: notes et documents (1909). Passy, Hippolyte (1793-1880). Passy was a cavalry officer in Napoleon’s army and after the restoration of the monarchy took a trip to the United States, during which he discovered the works of Adam Smith. After his return to France he wrote for several opposition papers, such as the liberal National (with Thiers and Mignet), and published a book, De l’aristocracie considérée dans ses rapports avec les progrès de la civilization (1826). Passy was elected as a deputy from 1830, serving as minister of finance in 1834, 1839-40, and 1848-49. In 1838 he became a member of the Académie des sciences morales et politiques, in which he served for some forty years and was particularly active in developing political economy. He criticized the colonization of Algeria and was an advocate of free trade. He was cofounder of the Société d’économie politique (1842) and wrote numerous articles in the Journal des économistes and several books, among which included Des systèmes de culture et de leur influence sur l'économie sociale (1848) and Des causes de l'inégalité des richesses (1848). Peel, Sir Robert (1788-1850). Leader of the Tories, former minister of Wellington, he became prime minister in 1841. He took measures aimed at alleviating the most severe poverty, thus giving some satisfaction to the free traders, while trying to broaden the outlook of the aristocracy. In order to repeal the corn laws, which was done on 26 May 1846, he managed to obtain a composite majority. The Tory Party, however, was irreparably divided, and on that same evening, he lost a vote of confidence on his Irish policy and had to resign. Petitti, Carlo Ilarione, conte di Roreto (1790-1850). Petitti was an Italian economist, academic, councilor of state, and senator. He wrote numerous works, including Saggio sul buon governo della mendicità, degli istituti di beneficenza e delle carceri (1837), Delle strade ferrate italiane e del miglior ordinamento di esse. Cinque discorsi Capolago (1845), and Considerazioni sopra la necessità di una riforma de’ tributi con alcuni cenni su certe spese dello Stato (1850). Physiocrats. The Physiocrats were a group of French economists, bureaucrats, and legislators who came to prominence in the 1760s and included such figures as François Quesnay (1694-1774), Anne-Robert-Jacques Turgot (1727-17811), Mercier de la Rivière (1720-1794), Vincent de Gournay (1712-1759), the Marquis de Mirabeau (1715-1789), and Pierre Samuel du Pont de Nemours (1739-1817). They are best known for coining the expression “laissez-faire” as a summary statement of their policy prescriptions. [See netry for Laissez-Faire]. As the name Physiocracy suggests (“the rule of nature or natural law”), they believed that natural laws governed the operation of economic events and that rulers should acknowledge this fact in their legislation. They believed that agricultural production was the source of wealth and that all barriers to its expansion and improvement (such as internal tariffs, government regulation, and high taxes) should be removed. The strategy of the Physiocrats was to educate others through their scholarly and journalistic writings as well as to influence monarchs to adopt ration economic policies via a process of so-called “enlightened despotism”. This strategy met with very mixed results, as Turgot’s failed effort to deregulate the French grain trade in the 1770s attests. Prince-Smith, John (1809-74). Liberal economist, born in London, where he worked as a parliamentary reporter before moving to Hamburg in 1828 to write for an English-language newspaper there. He was an ardent supporter of Bastiat. In 1831 he was employed as an English teacher at a local gymnasium. While in Hamburg Prince-Smith discovered economics and began writing about British economic developments for his German readers. In 1846 he settled in Berlin, where he published a small book on tariff reform in Britain and its likely impact on Europe after having become interested in Cobden, Bastiat, and the Anti-Corn-Law League. He also published works on banking and currency issues. In 1846 he founded a German free-trade association and was elected deputy representing Stettin in the Prussian parliament. Between 1870 and 1874 he was head of the Congress of German Economists. His writings include John Prince-Smith über die englische Tarifreform und ihre materiellen, sozialen und politischen Folgen für Europa (1846). His collected works, published shortly after his death, were titled John Prince-Smith’s Gesammelte Schriften (1877-80). Quesnay, François (1694-1774). Quesnay was both a surgeon and an economist. He taught at the Paris School of Surgery and was the personal doctor to Madame Pompadour. As an economist he is best known as one of the founders of the physiocratic school, writing the articles on “Fermiers” and “Grains” for Diderot’s Encylopédie (1756) and also Le Tableau économique (1762) and Physiocratie, ou constitution naturelle de gouvernement le plus avantageux au genre humain (1768). Quijano, Garcia (dates unknown). Member of the Société d’ économie politique and occasional contributor to the Journal des économistes. Raynal, Guillaume-Thomas-François, abbé (1713-96). Raynal was an enlightened historian who wrote on the Dutch Stadholderate and the English Parliament. His most famous work was the eight-volume Histoire philosophique et politique, des établissements et du commerce des européens dans les deux Indes (1770), which went through some thirty editions by 1789, was put on the Index in 1774, and publicly burned. The book was found objectionable because of its treatment of religion and colonialism and its advocacy of the popular right to consent to taxation and to revolt, among other things. Its sometimes incendiary treatment of the slave trade became canonical in the debate over abolition of slavery, of which it did much to spur. Renouard, Augustin-Charles (1794-1878). Renouard was a lawyer with an interest in elementary school education. He was secretary general of the minister of justice and an elected deputy. He also was vice-president of the Société d’économie politique and wrote or edited a number of works on economic and educational matters, including Mélanges de morale, d’économie et de politique extraits des ourvrages de Franklin, et prcédés d’une notice sur sa vie (1824), and “L’éducation doit-elle être libre?” in Revue encyclopédique (1828). La Revue Britannique. A monthly review that was founded in 1825 by Sébastien-Lous Saulnier (1790-1835). Its full title read Revue Britannique. Receuil international. Choix d'articles extraits des meilleurs écrits périodiques da la Grande-Bretagne et de l’Amérique, complété sur des articles originaux. It contained many articles on economic matters, such as the article in the 6th series, vol. 1, published in 1846, which was an unattributed piece on “La ligue anglaise” (Anti-Corn-Law League), which might have been by Bastiat. It ceased publication in 1901. Reybaud, Louis (1798-1879). Reybaud was a businessman, journalist, novelist, fervent antisocialist, politician, and writer on economic and social issues. In 1846 he was elected deputy representing Marseilles but his strong opposition to Napoleon III and the empire forced him to retire to devote himself to political economy. He became a member of the Académie des sciences morales et politiques in 1850. His writings include the prize-winning critique of socialists, Études sur les réformateurs et socialistes modernes: Saint-Simon, Charles Fourier, Robert Owen (1840), the satirical novel Jérôme Paturot à la recherché d’une position sociale (1843), and Économistes contemporains (1861). Reybaud also wrote many articles for the Journal des économistes and the Dictionnaire de l’économie politique (1852). Ricardo, David (1772-1823). Ricardo was born in London of Dutch-Jewish parents. He joined his father’s stockbroking business and made a considerable fortune on the London Stock Exchange. In 1799 he read Adam Smith’s Wealth of Nations (1776) and developed an interest in economic theory. He met James Mill and the Philosophic Radicals in 1807, was elected to Parliament in 1819, and was active politically in trying to widen the franchise and to abolish the restrictive corn laws. He wrote a number of works, including The High Price of Bullion (1810), on the bullion controvery, and his treatise On the Principles of Political Economy and Taxation (1817). Liberty Fund has reprinted his collected works, The Works and Correspondence of David Ricardo (2004). The Right to Work. The "right to work" (le droit au travail) had been a catch phrase of the socialists throughout the 1840s. What they meant by this was that the state had the duty to provide work for all men who demanded it. In contrast to this, the classical-liberal economists called for the "right of working" (la liberté du travail), by which they meant the right of any individual to pursue an occupation or activity without any restraints imposed upon him by the state. The latter point of view was articulated by Charles Dunoyer in De la liberté du travail (1845) and by Bastiat in many of his writings. The socialist perspective was provided by Louis Blanc in Organisation du travail (1839) and in Le Socialisme, droit au travail (1848), and by Victor Considérant in Théorie du droit de propriété et du droit au travail (1848). Matters came to a head in May 1848, when a committee of the Constituent Assembly was formed to discuss "the right to work" at a time when the state-run National Workshops were employing tens of thousands of unemployed Parisian workers. The nearly bankrupt National Workshops were forced to close in June, prompting widespread revolts throughout Paris, which resulted in their brutal suppression by the army. In a veritable "who's who" of the socialist and liberal movements of the day, a debate took place in the Assembly and was duly published by the classical-liberal publishing firm of Guillaumin later in the year along with suitable commentary by such liberals as Bastiat: "Le droit au travail à l'Assemblée nationale. Recueil complet de tous les discours prononcés dans cette mémorable discussion par MM. Fresneau, Hubert Delisle, Cazalès, Gaulthier de Rumiily, Pelletier, A. de Tocqueville, Ledru-Rolin, Duvergier de Hauranne, Crémieux, M. Barthe, Gaslonde, de Luppé, Arnaud (de l'Ariège), Thiers, Considerant, Bouhier de l'Ecluse, Martin-Bernard, Billault, Dufaure, Goudchaux, et Lagrange (texts revue par les orateurs), suivis de l'opinion de MM. Marrast, Proudhon, Louis Blanc, Ed. Laboulaye et Cormenin; avec des observations inédites par MM. Léon Faucher, Wolowski, Fréd. Bastiat, de Parieu, et une introduction et des notes par M. Joseph Garnier (Paris : Guillaumin, 1848). See also the entry on "Droit au travail" byLéon Faucher in the Dictionnaire de l'Économie politique, (1852–53), vol. 1. pp. 605-19. Rossi, Pellegrino (1787-1848). Rossi was born in Italy and lived in Geneva, Paris, and Rome. He was a professor of law and political economy, wrote poetry, and ended his days as a diplomat for the French government. He moved to Switzerland after the defeat of Napoleon, where he met Germaine de Staël and the duc de Broglie. He founded with Sismondi and Etienne Dumont the Annales de législation et des jurisprudences. After the death of Jean-Baptiste Say, Rossi was appointed professor of political economy at the Collège de France in 1833, and in 1836 he became a member of the Académie des sciences morales et politiques. In 1847 he was appointed ambassador of France to the Vatican but was assassinated in 1848 in Rome. He wrote Cours d’économie politique (1840) and numerous articles in the Journal des économistes. Saint-Cricq, Pierre Laurent Barthélemy, comte de (1772-1854). Saint-Cricq was a protectionist who was made director general of customs in 1815, president of the Trade Council, and then minister of trade and colonies in 1828. Saint-Simon, Claude Henri de Rouvroy, comte de (1760-1825). Saint-Simon came from a distinguished aristocratic family and initially planned a career in the military, and he served under George Washington during the American Revolution. During the 1780s he gave up his military career to become a writer and social reformer. When the French Revolution broke out, in 1789, he renounced his noble status and took the simple name of Henri Saint-Simon. Between 1817 and 1822 Saint-Simon wrote a number of books that laid the foundation for his theory of “industry” (see entry on Industry and “Note on the Translation”), by which he meant that the old regime of war, privilege, and monopoly would gradually be replaced by peace and a new elite of creators, producers, and industrialists. His disciples, such as Auguste Comte and Olinde Rodrigues, carried on his work with the Saint-Simonian school of thought. Saint-Simon’s views developed in parallel to the more-liberal ideas about “industry” espoused by Augustin Thierry, Charles Comte, and Charles Dunoyer during the same period (see entries for Charles Comte and Charles Dunoyer). What distuinguished the two schools of thought was that Saint-Simonians advocated rule by a technocratic elite and state-supported “industry,” which verged on being a form of socialism, while the liberal school around Comte and Dunoyer advocated a completely free market without any state intervention whatsoever, which would thus allow the entrepreneurial and “industrial” classes to rise to a predominant position without coercion. Saint-Simon’s best-known works include Réorganisation de la société européenne (1814), L’Industrie (1817), L’Organisateur (1819); and Du système industriel (1821). Say, Horace Émile (1794-1860). Son of Jean-Baptiste Say. Married Anne Cheuvreux, sister of Casimir Cheuvreux, whose family were friends of Bastiat. Say was a businessman and traveled in 1813 to the United States and Brazil. A result of his trip was Historie des relations commerciales entre la France et le Brésil (1839). He became president of the Chamber of Commerce of Paris in 1834, became a councillor of state (1849-51), and headed an important inquiry into the state of industry in the Paris region (1848-51). Say was also very active in liberal circles, participating in the foundation of the Société d’économie politique, the Guillaumin publishing firm, the Journal des économistes, the Journal du commerce; and was an important collaborator in the creation of the Dictionnaire de l’économe politique and the Dictionaire du commerce et des marchandises. In 1857 he was nominated to the Académie des sciences morales et politiques but died before he could join it formally. Say, Jean-Baptiste (1767-1832). Say was the leading French political economist in the first third of the nineteenth century. Before becoming an academic political economist quite late in life, Say apprenticed in a commercial office, working for a life insurance company; he also worked as a journalist, soldier, politician, cotton manufacturer, and writer. During the revolution he worked on the journal of the idéologues, La Décade philosophique, littéraire, et politique, for which he wrote articles on political economy from 1794 to 1799. In 1814 he was asked by the government to travel to England on a fact-finding mission to discover the secret of English economic growth and to report on the impact of the revolutionary wars on the British economy. His book De l'Angleterre et des Anglais (1815) was the result. After the defeat of Napoleon and the restoration of the Bourbon monarchy, Say was appointed to teach economics in Paris, first at the Athénée, then as a chair in "industrial economics" at the Conservatoire national des arts et métiers, and finally the first chair in political economy at the Collège de France. Say is best known for his Traité d'économie politique (1803), which went through many editions (and revisions) during his lifetime. One of his last major works, the Cours complet d'économie politique pratique (1828-33), was an attempt to broaden the scope of political economy, away from the preoccupation with the production of wealth, by examining the moral, political, and sociological requirements of a free society and how they interrelated with the study of political economy. Say, Léon (1826-96). Léon was a son of Horace Say and had a career as a banker and administrator of the Chemin de fer du nord. Say wrote a number of articles for the Jouural des débats and was a prominent popularizer of free trade and other economic issues. After 1871 he had a distinguished political career as a deputy for La Seine and then as minister of finance in the Third Republic, where he pursued policies of reducing taxation, deregulating internal trade, and opposing the Méline Tariff. In 1880 he was appointed ambassador to England. Say was elected to the Académie des sciences morales et politiques and also to the Académie française. He was a key editor of and contributor to the Nouveau dictionnaire d'économie politique (1891–92). Many of his writings on finance can be found in Les Finances de la France sous la troisième république (1898-1901). Scialoja, Antonio (1817–77). Italian economist and professor of political economy at the University of Turin. He was imprisoned and exiled during the 1848 Revolution. His major economic works were I principi della economia sociale esposti in ordine ideologico (1840); Trattato elementare di economia sociale (1848); and Lezioni di economia politica (1846-54). He also wrote many works on law. The former book was translated into French as Les Principes de l’économie exposé selon des idées (1844). Scrope, George Poulett (1797-1876). Scrope was an economist, Member of Parliament, and fellow of the Royal Society. He was an opponent of the Malthusian theory of population, believing that agricultural production, if unhindered, would always outpace population growth; an advocate of free trade and of parliamentary reform; and an advocate of freer banking using paper currency but following the principles of the Scottish free-banking school. His major theoretical work was Principles of Political Economy (1833). Senior, Nassau William (1790–1864). British economist who became a professor of political economy at Oxford University in 1826. In 1832 he was asked to investigate the condition of the poor and, with Edwin Chadwick, wrote the Poor Law Commissioners’ Report of 1834. In 1843 he was appointed a correspondent of the Institut de France, In 1847 he returned to Oxford University. During his life he wrote many articles for the review journals, such as the Quarterly Review, the Edinburgh Review, and the London Review. His books include Lectures on Political Economy (1826) and Outline of the Science of Political Economy (1834). Slavery (slave trade, right of inspection). Slavery did not have a strong presence within France, but it played a major role in the French Caribbean colonies, such as Saint-Dominque (Haiti). Under the influence of the ideas of the French Revolution, slavery was abolished in 1794 and a number of freed blacks were elected to various French legislative bodies. Napoléon reintroduced slavery in 1802 and fought a bloody but unsuccessful war in order to prevent a free black republic from emerging in Haiti. In 1807, under pressure from such abolitionists as William Wilberforce and Thomas Clarkson, Britain passed an act that abolished the slave trade, much of which was carried in British vessels. The United States followed suit in 1808 with a similar ban. This had significant implications for the southern states of the United States and the French Caribbean, where slavery remained firmly in place. The British Navy patroled the oceans, insisting upon a “right of inspection” to look for slaves being carried from Africa to the Caribbean and to punish those involved in the trade as pirates. This policy was a serious bone of contention between Britain and France, as the latter viewed the British policy as interference in their sovereign right to engage in trade and shipping. Slavery was abolished in the British Caribbean in 1833, again in the French colonies during the 1848 revolution, and in the United States in 1865 (the 13th Amendment). Smith, Adam (1723-90). Smith was a leading figure in the Scottish enlightenment and one of the founders of modern economic thought with his work The Wealth of Nations (1776). He studied at the University of Glasgow and had as one of his teachers the philosopher Francis Hutcheson. In the late 1740s Smith lectured at the University of Edinburgh on rhetoric, belles-lettres, and jurisprudence which are available to us because of detailed notes taken by one of his students. In 1751 he moved to Glasgow, where he was a professor of logic and then moral philosophy. His Theory of Moral Sentiments (1759, translated into French in 1774) was a product of this period of his life. Between 1764 and 1766 he traveled to France as the tutor to the duke of Buccleuch. While in France Smith met many of the physiocrats and visited Voltaire in Geneva. As a result of a generous pension from the duke, Smith was able to retire to Kirkaldy to work on his magnum opus, The Wealth of Nations, which appeared in 1776 (French edition in 1788). Smith was appointed in 1778 as commissioner of customs and was based in Edinburgh, where he spent the remainder of his life. An important French edition of the Wealth of Nations was published by Guillaumin with notes and commentary by leading French economists such as Blanqui, Garnier, Sismondi, and Say and appeared in 1843. The most complete edition of Smith’s works is the Glasgow Edition of the Works and Correspondence of Adam Smith, originally published by Oxford University Press (1960) and later by published by Liberty Fund in paperback (1982–87). Société d’économie politique (Society of Political Economy) was founded in 1842, with the name “Réunion des economistes” and began meeting regularly in October 1842. Summaries of the meetings were published by Joseph Garnier, the permanent secretary and vice president of the society, in the Journal des économistes. The articles “Adresse au président de la ligue anglaise son adhésion sympathique aux principes de cette association” 13 (December-March 1846): 19; “Réponse de M. Cobden au nom de la Ligue” 14 (April-July 1846): 60; and “Banquet offert à M. Cobden” 15 (August-November 1846): 89 show the very great interest the society had in Cobden’s activities in England. Storch, Henri-Frédéric (1766-1835). Storch was a Russian economist who was influenced by the writings of Adam Smith and J.B. Say. He was noted for his work on the economics of unfree labor (particularly that of serfdom), the importance of moral (human) capital to national wealth, comparative banking, and the greater wealth-producing capacity of industry and commerce compared with agriculture. Storch studied at the universities of Jena and Heidelberg before returning to Russia, where he taught, worked in various positions in education and government administration, and became a corresponding member of the Saint Petersburg Academy of Sciences. He was chosen to teach various members of the Russian royal family (tutor to the daughters of Tsar Paul I and then appointed by Alexamnder I to teach political economy to the grand dukes Nicholas and Michael). He bcame a state councillor in 1804 and head of the Academy’s statistical section. In 1828 he was promoted to the rank of private councillor and appointed vice president of the Academy of Sciences, offices that he held until his death. His major theoretical work was his six-volume Cours d'économie politique, ou exposition des principes qui d éterminent la prospérité des nations (1815), which was based upon the lectures he gave to the grand dukes. Sudre, Alfred (1820-?). Economist and political writer. He was author of Histoire du communisme ou Réfutation historique des utopies socialistes (1850). Thiers, Adolphe (1797-1877). Thiers was a lawyer, historian, politician, and journalist. While he was a lawyer he contributed articles to the liberal journal Le Constitutionel and published one of his most famous works, the ten-volume Histoire de la révolution française (1823-27). He was instrumental in supporting Louis-Philippe in July 1830 and was the main opponent of Guizot. Thiers defended the idea of a constitutional monarchy in such journals as Le National. After 1813 he became successively a deputy, undersecretary of state, minister of agriculture, and minister of the interior. He was briefly prime minister and minster of foreign affairs in 1836 and 1840, when he resisted democratization and promoted some restrictions on the freedom of the press. During the 1840s he worked on the twenty-volume Histoire de consulat et de l’empire, which appeared between 1845 and 1862. After the 1848 revolution and the creation of the Second Empire he was elected deputy representing Rouen in the Constituent Assembly. Thiers was a strong opponent of Napoleon III’s foreign policies and after his defeat was appointed head of the provisional government by the National Assembly and then became president of the Third Republic until 1873. Thiers wrote some essays on economic matters for the Journal des économistes, but his protectionist sympathies did not endear him to the economists. Thompson, Thomas (1783-1869). Owner of the Westminster Review, he was an active member of the Anti-Corn-Law League. In 1811 he became governor of Sierra Leone, where he fought slavery. Turgot, Anne Robert Jacques, baron de Laulne (1727-81). Turgot was an economist of the physiocratic school, a politician, a reformist bureaucrat, and a writer. During the mid 1750s Turgot came into contact with the physiocrats, such as Quesnay, Dupont de Nemours, and Vincent de Gournay (who was the free-market intendant for commerce). Turgot had two opportunities to put free-market reforms into practice: when he was appointed Intendant of Limoges in 1761-74; and when Louis XVI made him minister of finance between 1774 and 1776, at which time Turgot issued his six edicts to reduce regulations and taxation. His works include Eloge de Gournay (1759), Réflexions sur la formation et la distribution des richesses (1766), and Lettres sur la liberté du commerce des grains (1770). Utopias. An important part of the classical liberal critique of socialism was its analysis of the utopian vision many socialists had of a future community where their ideals of common ownership of property, the equality of economic conditions, state-planned and state-funded education, and strictly regulated economic activity for the "common good" were practiced. Bastiat makes many references in his writings to the ideas and proposed communities of people like Fénelon, Saint-Simon, Fourier, and Owen. In an article titled "Utopie," by Hippolyte Passy, in the Dictionnaire de L'Économie Politique (vol. 2, pp. 798-803), which summed up the thinking of the liberal political economists on this topic just two years after Bastiat's death, Passy stated that Bastiat had provided the key insight into the differences between the socialists' and the economists' vision of the future of society: the socialist vision was a "factice," or artificial one, with an order imposed by a ruling elite, party, or priesthood; while the liberal vision was a "natural," or spontaneous, one that flowed "harmoniously" from the voluntary actions of individuals in the marketplace. Given the harshness of the economists' rejection of socialist utopian schemes, it is rather ironic that the classical liberals also had their utopian moments. One could mention Condorcet's idea of the "Tenth Epoch" (1795), Charles Comte's and Charles Dunoyer's idea of the "industrial stage" of economic development (1820s), and Gustave de Molinari's vision of a fully privatized society where there was no role left for the state (1849). See also Reybaud’s Études sur les réformateurs contemporains (1849). Villermé, Louis René (1782-1863). Military surgeon, then civilian doctor. He was also a member of the Académie des sciences morales et politiques. He wrote on public-health issues such as prisons, mortality rates, population growth, and the condition of workers. On the latter he wrote Tableau de l’état physique et moral des ouvriers employés dans les manufactures de coton, de laine, et de soie (1840), which became a basis for labor regulations. Voltaire (François-Marie Arouet) (1694–1778). Voltaire was one of the leading figures of the French Enlightenment. He first made a name for himself as a poet and playwright before turning to political philosophy, history, religious criticism, and other literary activities. He became notorious for his outspoken campaign against abuses by the Catholic Church and the use of state torture in the Calas Affair, in the 1760s. Voltaire wrote a number of popular works, including Lettres philosophique (1734), in which he admired the economic and religious liberties of the English; his philosophic tale Candide (1759); his pathbreaking work of social history Le Siècle de Louis XIV (1751); his Traité sur la tolerance (1763); and the Dictionnaire philosophique (1764), which contained his criticisms of religion and superstition. Whately, Richard (1787-1863). Whately was archbishop of Dublin and professor of political economy at the University of Oxford, where he was an important member of Nassau Senior’s group. Whately wrote many works of theology before turning to political economy. He was an opponent of the Ricardian school and is considered to be an early adherent to the subjective theory of value. He published his Oxford lectures delivered in Easter Term 1831 as Introductory Lectures on Political Economy (1832). He also wrote a popular work designed to introduce young readers to ideas about money: Easy Lessons on Monetary Matters (1849). Wilson, George (1808-70). Wilson was a businessman whose main business interests were the management of railways and telegraphs. He had a long involvement in the liberal politics of Manchester and later became chairman of the Anti-Corn-Law League. Wilson, James (1805-60). Born in Scotland, he founded The Economist in 1839 and was elected a member of parliament in 1847. His books include Influence of the Corn Laws (1839) and Capital, Currency, and Banking (1847), which was a collection of his article from The Economist. Wine and Spirits Tax. Eliminated by the revolutionary parliament of 1789, the tax on wine and spirits was progressively reinstated during the empire. It comprised four components: (1) a consumption tax (10 percent of the sale price); (2) a license fee paid by the vendor, depending on the number of inhabitants; (3) a tax on circulation, which depended on the département; and (4) an entry duty for the towns of more than four hundred inhabitants, depending on the sale price and the number of inhabitants. Being from a wine-producing region, Bastiat had always been preoccupied by a law that was very hard on the local farmers. Wolowski, Louis (1810-76). Wolowski was a lawyer, politician, and economist of Polish origin. His interests lay in industrial and labor economics, free trade, and bimetallism. He was a professor of industrial law at the Conservatoire national des arts et métiers, a member of the Académie des sciences morales et politiques from 1855, serving as its president in 1866-67, and member and president of the Société d’économie politique. His political career started in 1848, when he represented La Seine in the Constituent and Legislative Assemblies. During the 1848 revolution he was an ardent opponent of the socialist Louis Blanc and his plans for labor organization. Wolowski continued his career as a politician in the Third Republic, where he served as a member of the Assembly and took an interest in budgetary matters. He edited the Revue de droit français et etranger and wrote articles for the Journal des économistes. Among his books are Cours de législation industrielle. De l’organisation du travail (1844) and Études d’économie politique et de statistique (1848), La question des banques (1864), La Banque d’Angleterre et les banques d’Ecosse (1867), La liberté commerciale et les résultats du traité de commerce de 1860 (1869), and L’or et l’argent (1870). Zollverein. The Zollverein was a German customs union that emerged in 1834 when the southwestern German states of Baden and Württemberg joined the Prussian customs union. The Prussian state and its territories had created an internal customs union in 1818 following the economic turmoil of the Napoleonic wars and the increaase in size of Prussian-controlled territory. It was based upon the relatively low Prussian customs rate, which meant that the expanded German customs union created a significant trading zone within the German-speaking part of Europe with a relatively low external tariff rate and the hope of increasing deregulation of trade within the trading zone.